Editors Comments: Yours truly was a spectator at the first Ponca City Grand Prix (PCGP). Somewhere is a bunch of information about the first year that Margaret England collected. When I find it I will revise this section accordingly. Like all events that happened over 50 years ago, memories fade and stories change with each retelling. Hopefully most of what follows is factual, at least in my mind... Once again I solicit any and all opinions, facts, recollections and lies about 1961 or any year of the PCGP. 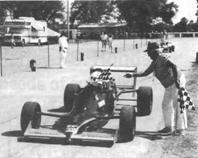 The first Ponca City Grand Prix was held June 17 & 18, 1961. The first mention of the race in the Gazette was in the February, 1961 edition. A simple listing in the calendar of events was "June 17-18 Race, Ponca City, Okla."
Ponca City actually lies within the boundaries of NEOKLA Region. The first race program (editor's memory here) described how two businessmen (assumed to be SCCA members) from Tulsa were flying over Ponca City and noticed the roads in the City Park connected to make a "road course". It appears the first PCGP may have been a NEOKLA event. There is no mention of workers needed in later Gazettes, although the June issue noted duty of Oklahoma Region members to participate in the Petite Prix Race coming in August. My memories of that first PCGP as a spectator have faded over the years, but I recall being enamored by a metallic green '34 ford pickup custom parked in the spectator parking. The action on the track was fast and furious as the cars came by about every minute. There were short, eight lap "qualifying events" followed by 20 and 30 lap main events. I only recall the feature event with the big "modifieds". 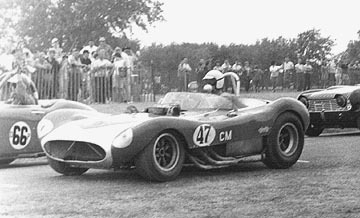 Jack Hinkle's immaculate Birdcage was the obvious class of the field, but the pale blue Chevarri of Dean Knight gave Hinkle a good race. The track announcer (assumed to be Kirk Hoover, though I don't recall his distinctive voice) kept saying Dean Knight was driving. In reality it was owned by Dean but driven by Bobby Alyward. A few years later I learned from a race official at the first event, that Hinkle and Alyward scripted their races, with Jack telling Bobby how long he would play and hold back. I was most fascinated with two other cars: Dave Burtner's burgundy C Type Jaguar and (driver's name forgotten) LeMans Allard. The Allard had a full fendered polished aluminum body and Flathead Ford V-8 power. The photo of these two modifieds is to the left. Dave would later drive the C Type in the "Intercity Gymkhana" between NEOKLA and OK Regions, taking FTD. To this day I remember the taste of the PCGP concession stand hamburgers. Not gourmet or connoisseur food, but strangely enchanting. Finally I recall looking for the POW camp guard towers Northwest of Tonkawa on the trip home. My father pointed these out to us on the trip, and every time I return to Ponca the sight of them gives me pause. Entrees from Oklahoma region included Don Taylor-Sprite, Doc Roberts, George Evans, Forest Jones-MGA, Jerry Salyer-Porsche, Tommy Allen-Porsche, Guy McMurray-Berkeley, Bob Simons-Karmen Ghia, George Evans-MGA, Ray Herndon-Sprite, John Rainbolt-TR3, Rick Kelly-Morgan, Ben Ellis-Thomas Scovil Special, Danny Moore-DKW, C.S. Trosper-Porsche and Rich Dilbeck-Porsche. In the first race Saturday, won by Bob Harness of Topeka, Don Taylor flipped his Sprite on turn 2 about halfway thru the race. Don was not hurt but his car was through for the weekend. Don was driving a damn good race at the time which made the accident all the worse. David Kirk of Pond Creek also flipped his HM special in this race. Ray Herndon finished 3rd in class & fourth overall in his Sprite. 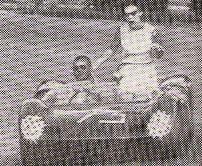 Bob Simons, driving a small car for the first time, as his Ferrari was not ready after the Mansfield mishap, finished 1st in class. Tom Moore finished 2nd in his DKW. 15 laps, time 21:33, lap average 1:20. In the second race Rich Dilbeck grabbed the lead at the start and held it all the way to finish first overall. Jerry Salyer chased Rich every inch of the way and finished second overall. 7th overall went to Forest Jones. 15 laps, time 17:45, lap average 1:10. Third race was won by Barnes of Dallas driving an Alfa with Tommy Allen finishing second overall and in class. John Rainbolt finished third in EP and fifth overall. 20 laps, time 23:4b, lap average 1:11. Fourth race was won by Bob Vandawalker in his Corvette. C. S. Trosper fought off Harvey Woodward’s Bristol to win first in class and fourth overall. 20 laps, time 21:42, lap average 1:05. The first race Sunday was won by Vernon Bixby’s Fiat Abarth. Ray Herndon finished third in class HP, Bob Simons first in class GT, Guy McMurray first in class JM and Tom Moore fifth in class HM. 20 laps, time 25:12, lap average 1:25. Second race Sunday was reverse order of Saturday as Jerry Salyer won first overall and Rich Dilbeck, who spun out, finishing second overall. George Evans-MGA of Norman finished sixth in class and Ben Ellis won first in class FM. 20 laps, time 23:36, lap average 1:16. Third race won by Jack Hinkle driving the Birdcage -- no sweat here. 20 laps, time 21:29, lap average 1:04. Fourth race Sunday won by Bill Riggs TR3. John Rainbolt lying 3rd overall had to drop out due to mechanical trouble. 20 laps, time 2312, lap average 109. Allen chased Mr. Barnes’ Alfa across the finish line again and won second in class DP. 20 laps, time 23;30, lap avg. 1:15. In the feature race Sunday Mr. Hinkle’s birdcage again toyed with the field to win easily with bobby Alyward second. 30 laps, time 31:17, lap average 1:o4. Jack Hinkle also set the track record in pracice with a time of 58:7. All in all the Oklahoma region drivers showed very good with 8 first, 3 seconds, 3 thirds, two fifths - scotch please - and 1 sixth all in class. PONCA CITY – Jack Hinkle of Wichita, Kan, driving a Maserati-Birdcage, scored an easy victory Sunday in the feature race of the first annual Ponca City Grand Prix sports car races. Hinkle toured the 1.5 mile road course through the curves of Lake Ponca Park in a record time of 31:17 minutes during the afternoon’s 30 lap feature event. A crown of 9,000 watched Hinkle outrun a Wichita buddy, Bob Alyward, who piloted a Shevarri. Finishing third and fourth in the main race were Tulsa’s Curtis Muncy in a Formula Junior and Douglas Theim of Elm Grove, Wisc. in a Corvette. Hinkle also posted the best individual lap time when he was clocked in1:02 during the feature. He had an average lap time of 1:04. In earlier 20 lap races, overall winners were Vernon Bixby, Topeka, Kan. In a Fiat Abarth; Jerry Salyer, Oklahoma City, in a Porsche; Hinkle; Bill Riggs, Kansas City in a Triumph TR-3 and Theim. In the five early races, class competition was held within each race. Several Oklahomans won their various classes. 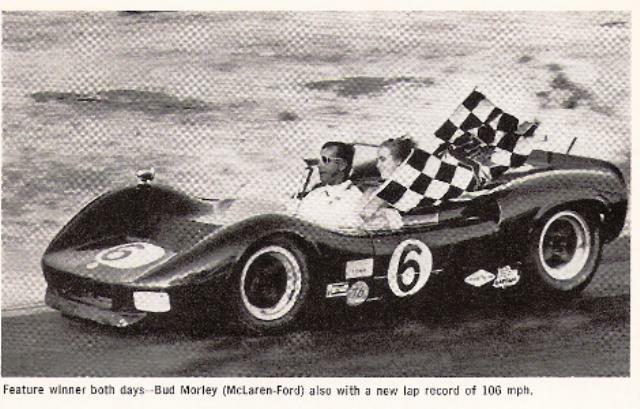 Oklahoma City’s Ben Ellis won F-Modified in his Thomas-Scovil Special; Guy McMurray, of Midwest City, paced the J –Modified field in his Berkeley; Bob Simon, Norman won the GT action in a Karman-Ghia; David Burtner, Muskogee nabbed C-Modified in his Jaguar, and Robert Hayes, Vinita, took C-Production honors in an Ace-Bristol. Hinkle and Alyward battled for honors in the day’s third race also with Hinkle finally winning after taking the lead on the 18th lap. The lead swapped hands on 17 occasions. overall. 7th overall went to Forest Jones. 15 laps, time 17:45, lap average 1:10. Fourth race was won by Bob Vandawalker in his Corvette. The first race Sunday was won by Vernon Bixby’s Fiat Abarth. class GT, Guy McMurray first in class JM and Tom Moore fifth in class HM. 20 laps, time 25:12, lap average 1:25.
won second in class DP. 20 laps, time 23;30, lap avg. 1:15.
laps, time 31:17, lap average 1:o4. Jack Hinkle also set the track record in pracice with a time of 58:7.